Today, a new entry point for the Bonneville family has arrived in the form of a classic-styled Bonneville T100. Now even more accessible and lighter than the T120, The Bonneville T100 makes owning an original icon easier than ever before as it is priced at Rs. 7.78 lakhs ex-showroom Delhi. Powered by the 900cc Bonneville engine with more torque, better fuel economy and a rich, deeper exhaust note, the engine is specifically tuned to achieve much higher torque much lower down, it produces a peak torque figure of 80 Nm at 3200 rpm – an increase of 18% on the outgoing Bonneville T100 with improved fuel efficiency of up to 29% too. It also has a 270° firing interval for a smooth, linear power delivery. This, combined with a new extended service interval of 10,000 miles (16,000 kms) dramatically reduces the overall cost of ownership. In the handling department, the bike is fitted with custom developed Pirelli Phantom Sportscomp tyres as standard, designed especially by Pirelli for the Bonneville family with stiffness and profile changes to the front tyre, and deeper tread on the rear for secure handling and improved durability. 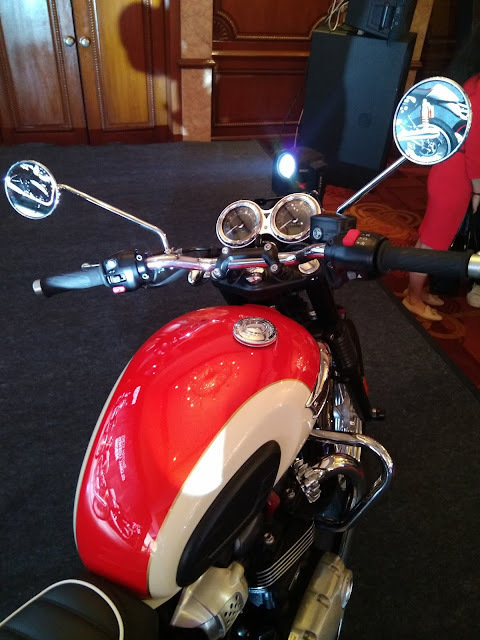 The bike also has many safety related equipment like Ride-by-Wire, ABS, Switchable Traction Control, Torque Assist Clutch, Engine Immobilizer along with useful features like USB Charging Socket under the seat. “Triumph Motorcycles has set new standards within the modern classics in India. 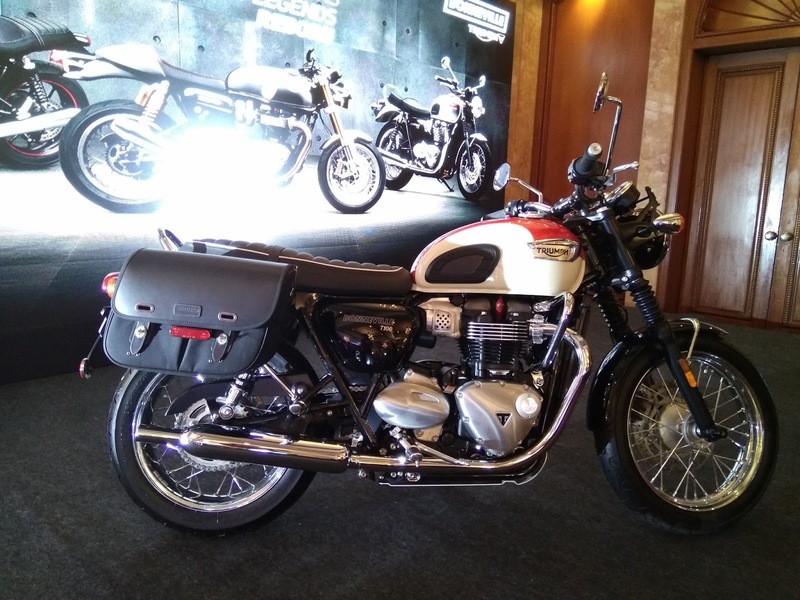 In the last 3 years of our India operations, over 1,250 customers have become proud owners of Triumph’s classic- range of motorcycles. 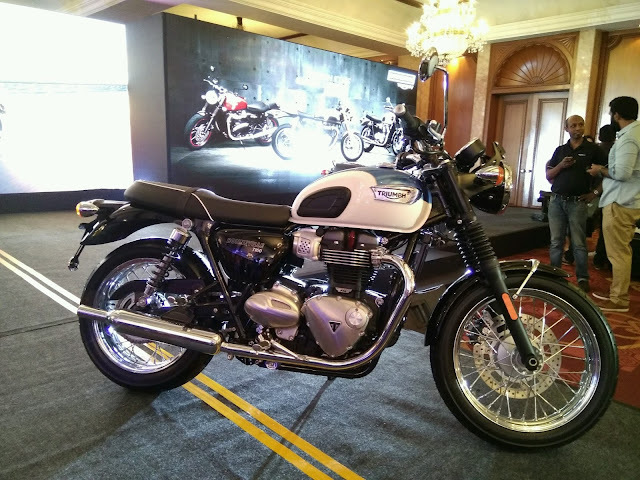 With the launch of the all new Triumph Bonneville T100, we continue to add market-leading models for riders in India, and take pride in offering the widest range of luxury motorcycles to the Distinctive colour schemes." Jet Black discerning Indian rider. A complete range of over 150 quality accessories makes it easy for riders to really make their Bonneville T100 their own. 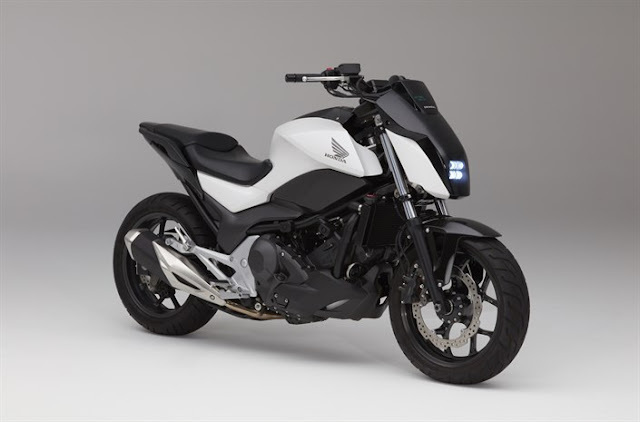 For increased comfort and practicality, accessories include heated grips, a centre stand and grab rail and cruise control. For the long distance rider, there is a range of premium luggage options to choose from including sand leather tank bag and leather canvas mix panniers.